There are three types of ADHD: Inattentive, predominately hyperactivity and combined type. Girls are more prevalent to exhibit the symptom of inattentiveness, whereby boys tend to be more hyperactive. As a child with undiagnosed ADHD becomes a teenager, he/she may become involved in drugs and crime and will commonly drop out of school. In adulthood the predominant features are failure to complete tasks, disorganization, difficulty paying attention and difficulty beginning tasks. The conventional medical treatment for ADHD is almost always pharmaceutical drugs such as methylphenidate (Ritalin) or or the amphetamine Adderall. A review in the Journal of Clinical Psychiatry notes that two antidepressants -- bupropion and venlafaxine -- are now being used as an alternative. "Talk therapy" is often recommended in conjunction with prescription medication for ADHD. The causes of ADHD are many and it would serve your child well for the parents to investigate the possible underlying factors that could very-well be causing the condition. The Functional Medicine Approach looks at the triggers of ADHD. People with ADHD often have impaired digestion, environmental and food sensitivities, nutritional insufficiencies, heavy metal toxicities, fatty acid and amino acid imbalances, sensitivity to food additives and sucrose (sugar). Some studies indicate a possible genetic predisposition. Children with ADHD usually have histories of more ear infections (otitis media) than other children with learning problems. It is unfortunate that many people who have children suffering with ADHD are not informed of all the options. I must agree that prescription medications such as Ritalin and Adderall can make a significant impact on the symptoms of ADHD. A child who once was inattentive is now focused and doing well in school. Who can ask for anything better?!! But, are you being told everything? What are the long-term health risk for your child? Studies done on children taking Ritalin using a PET scan revealed that although the children had a reduction in their symptoms the PET scan was highly abnormal. Most physicians are trained to treat ADHD with amphetamine-like drugs. But nutritionally oriented physicians have known for a long time that food allergy is a primary cause. The first major scientific study to show the link between food allergy and hyperactivity appeared in a 1985 issue of Lancet, a prestigious international medical journal. Dr. J. Egger, head of a pediatric university hospital in Munich, and Dr. J Soothill, London, England, studied the effect of food on 76 hyperactive children. 79% had clear improvement in their mental activity, emotions and behavior and 28 became completely normal. To prove their findings, the researchers reintroduced the allergenic foods to the children and their hyperactive symptoms returned. Heavy metal toxicity especially lead has been linked to attention deficit and learning problems. Dr. H.L. Needlemen of the University of Pittsburgh Medical School has conducted scores of studies over the last 20 years clearly establishing the link between lead levels in children and specific hyperactive and attention deficit behavior traits. Follow-up studies indicate that these effects often persist into adulthood. A person with ADHD symptoms tend to have slow beta brain waves. Beta brainwaves are associated with waking states or normal, alert consciousness. You are using Beta brainwaves by reading this article and processing the information. Additionally, an ADHD brain will tend to have higher amounts of alpha and theta brainwave activity (ref1). Alpha waves are associated with the subconscious, while Theta waves are associated with daydreaming. If the brainwaves responsible for alertness and focus are running slow while those for daydreaming are running fast, that person will display the common symptoms of ADD/ADHD. You can learn more about how to detect brainwave imbalance and how to correct it with neurofeedback at my Clear Mind site. I would have to say that I have not met a parent who did not want the best for their child. The parent who is struggling with what to do to help their child, faces a major dilemma. 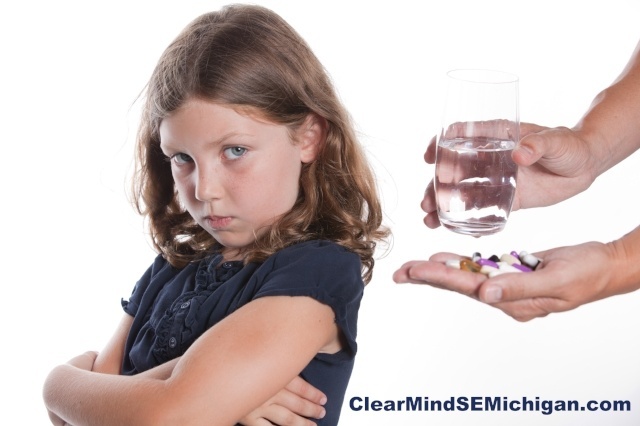 Should you medicate your child or take the road less traveled and identify the underlying cause of your child's problem. Realize you have two sides of this sensitive issue. On one hand you have your family physician who insist that pharmaceutical drugs is the only way to go and offers no real alternative. And on the other hand, the volumes of medical research is quite over-whelming in favor of looking for the root cause(s) of your child's condition.